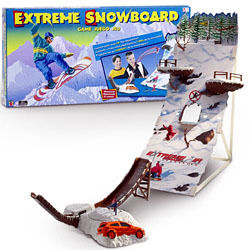 Extreme Snowboard is the only game where kids can live out the fantasy of snowboarding all year long. Use the power ramp launcher to launch a snowboarder onto the 3-D mountain and score points. The more difficult the landing, the more points you score. Kids take turns launching their plastic snowboarders at the face of a hazard-strewn mountain, scoring points (or not) depending on where their guys end up. Land on a ledge? You've got points. Land in a tree? You've got trouble. These dudes really fly, and testers loved honing their aim and watching the spectacular wipeouts.